Thank you again for all of your comments. It has been so much fun reading them. And yes,, the ice cream was yummy - but I did skip the bananas on it. Decided that was much too healthy. I absolutely love this little elf. It was my husband's from when he was a little boy (so another antique). Every year I find a special spot on the tree for it. So now we've gone from the 50's into the 60's and instead of ponies I've graduated into kittens. My parents were very understanding when I brought Princess, the beagle puppy, home and then Brutus, the little orange kitten. Princess lived for over 20 years with them. Now we are into the 70's - boy time sure does fly! 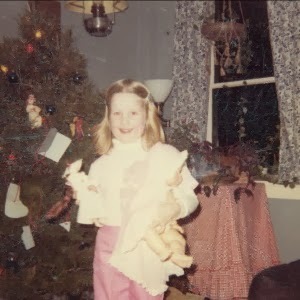 This is our oldest daughter, Marta, in front of our "Charlie Brown" Christmas tree. Well I hope you've enjoyed the pictures today. Don't forget to go to Henry Glass Fabrics and comment there to win. Tomorrow I'll post another great link for you to see. The first year we were married my husband and I had a Charlie Brown tree. He was out of town on business for most of December that year and by the time we got to the tree lot to buy a tree there wasn't much to choose from. But somehow even ugly trees turn out looking festive! LOVE THE ONE WITH THE CAT! The elf is sweet and so are the pictures! Thanks for sharing! Beautiful blond hair certainly runs in your family. Beagles and cats - you are bringing up so many memories for me. I had Barney (the Beagle) and Buttercup (the orange cat). I have two elves, you can never find the ones like they used to make. We had a little elf, too, but he didn't look like this one. I sure wish I still had him! It's been fun looking at your pictures and reading your stories. I had puppies and kittens too. I can see that blond hair runs in the family. It does in mine, too. All my sisters have it, but ours is very fine and natural curly. I always loved it because I didn't have to put rollers in it. Have a great day! I like the elf and you look beautiful in the magenta dress! 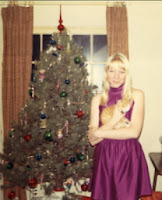 It is fun to decorate the tree with ornaments from many years ago. It usually brings up memories of people and things you were doing back then. that elf is adorable. Great 60's photo. Very pretty dress. What a cute little elf! I love looking at family photos...and not just mine. So many memories.